Keith Urban has turned to the stage during The Grand Ole Opry on Friday night, his first public appearance since vocal surgery late last year. He played three songs and an encore. He was joined by a string quartet on Long Hot Summer, then sang Making Memories of Us microphone-free with the audience. The 44-year-old Australian had a polyp removed from a vocal cord last November. 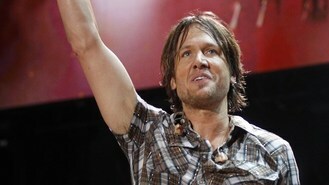 His last public performance was at a taping for the CMA Country Christmas television special in mid-November. The surgery forced Urban to postpone the tail end of his 2011 tour and his All For The Hall benefit for the Country Music Hall of Fame. The mother of the actress Phil Spector was convicted of killing has settled her wrongful death suit against the Wall of Sound music producer, a lawyer said. Bee Gees star Robin Gibb has spoken of his "spectacular" cancer recovery - and said: "I feel fantastic. Jessie J, Professor Green and Ed Sheeran are among the acts added to the bill of the Radio 1's Olympic event, Hackney Weekend. Geri Halliwell declared "pop is my first love" as she revealed her excitement at releasing a comeback album. Troggs frontman Reg Presley has told fans he has lung cancer and has decided to "call time" on the band. K'Naan says he is seeking legal action, upset that Republican presidential candidate Mitt Romney used his song Wavin' Flag during his Florida primary victory speech. Lisa Marie Presley has revealed she is not happy with the representations of her father, Elvis, on film. The coroner who oversaw the inquest into the death of singer Amy Winehouse has resigned after her qualifications were questioned. Nicki Minaj has revealed her diva-style rider demands - which include roses, scented candles and even breakfast.